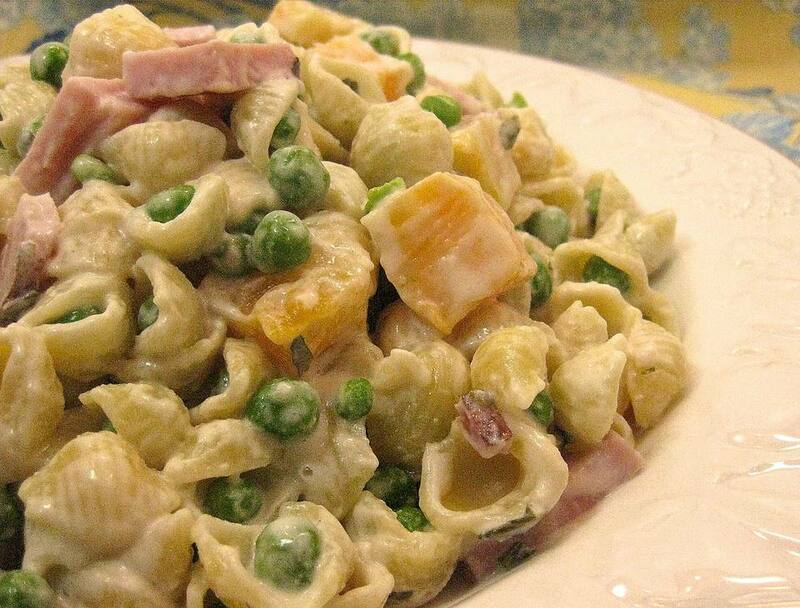 A ranch ham salad is a super simple recipe that is easy to make and very delicious. It's perfect for dinner on a hot summer night. It keeps well and is a great recipe to make any time of the year. Use any frozen vegetable you'd like. You can vary the kind of cheese used too, and even the pasta. I would substitute gemelli or rotini pasta for the small shell pasta in this recipe. And cubed Havarti, cheddar, or Swiss cheese would be a delicious substitution for the Cojack. With just five ingredients, you can serve this salad as-is, or add any ingredients you'd like. Some grated carrots, chopped red or yellow bell peppers, or sliced zucchini or yellow summer squash would be delicious. This salad is delicious served immediately, or you can cover and refrigerate it and eat whenever you want. All you need to serve with this salad is a glass of iced tea, some white wine, or a cold beer. For dessert, try some homemade brownies or chocolate chip cookies. In a large pot of boiling water, cook the pasta until tender or al dente according to package directions. Meanwhile, place the peas in a colander in the sink and drain the cooked pasta over the peas to thaw. Drain well. Meanwhile, combine the ham, Cojack cheese, and creamy ranch salad dressing in a large serving bowl. Stir in the drained pasta and peas and mix gently to coat. Serve this salad immediately, or chill in the refrigerator for 2 to 3 hours before serving.